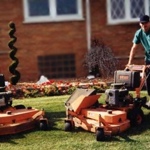 Lawn Maintenance Services – Don's Custom Landscaping Inc.
We offer services for residential and commercial properties! Weekly service is provided to maintain your lawn care needs. Our crew is very professional and well experienced. Weekly service includes grass cutting, edging, weed-wacking, leaf pickup and blowing of all walkways.